Overview A market leader for over 17 years, CyberBingo know exactly what it takes to give their players the very best playing experience. The site is bright and fresh, combining the very latest technical advances with an easy to navigate layout. Everything is clear and at hand to ensure that you can be playing your favorite games straight away. Their attention to detail shows that they have listened hard to their players and built upon their experience to give players exactly what they want. Bingo at its Best! Warm Welcome CyberBingo welcomes you with what must be the warmest welcome anywhere. There’s a massive 1000% welcome package waiting for you, that’s an incredible 500% bonus on your first deposit and a further 250% bonus on both your 2nd and 3rd deposits. Fantastic reload bonuses are not limited to new players, every future deposit you make receives up to 100% reload bonus and even more if you take advantage of their promotions. 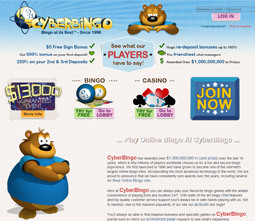 CyberBingo make signing up and starting to play a simple and rewarding process, the registration is quick and simple and you are not obliged to enter card details just to register. Sign up and take a look around and you will find that they have built this site on years of experience and by listening to their players. Incorporating the very latest software, CyberBingo bring you the very best playing experience in a 100% safe and secure environment. Games and Promotions There’s a fantastic selection of rooms to choose from as soon as you log into your account, these are varied in style and game content and there is guaranteed to be something for everyone. A great mixture of 90 or 75 ball games and high low stakes mean that you will have hours of fun playing at CyberBingo. There are also many exclusive and fun side games to play along with traditional slots, video poker and countless Casino games. This really is a site that has something for everyone. CyberBingo don’t rest on their laurels, every month they bring players fantastic new and exciting promotions where they can win fantastic prizes. Their big Bingo Event every month means that one lucky player will be walking away with £5,000 cash. Now that is something to write about. CyberBingo has an award winning team of chat hosts that are always at hand to both help and entertain players with their fantastic chat games. Players can really feel at home in the chat rooms and have great fun as they play for extra free money in the wide assortment of chat games that play every day. You are guaranteed hours of fun and excitement with some of the very best chat hosts anywhere. Security and Support Good service comes as standard at CyberBingo and they have a support team available to assist you with any questions 24hrs a day 365 days a year. Their live helper system means that you can talk online to one of their knowledgeable staff members instantly and be assured of a quick resolution to any questions that you may have. Cyberbingo have the highest levels of security and encryption to ensure that you have nothing to worry about. They accept a wide range of safe and secure funding options such as such as Visa, My Voucher, eGoldWallet, Western Union, Discover Cards, Bank Transfer, Money Transfer, Instadebit, Neteller, UKash and MoneyBookers.